Discussion in 'Fellowship Forum' started by Prayer Warrior, Nov 7, 2018. Last summer, on the day before my birthday, God blessed me with a special gift. I walked out onto my porch, and there was a parakeet sitting there. Thinking that it belonged to someone in our area and had gotten loose, we caught it, put it in a makeshift cage, and spent the next few days trying to find the owner. Much to my dismay, no one claimed the bird. I didn't want to let the pour thing go again, so we bought a small cage and some food so that it wouldn't die while we tried to figure out what to do with it. Of course, we didn't name it, knowing that if we did, we would get attached. As the days went by, the bird settled in and started softly chirping, then fussing, and then screaming at us. It was hilarious! Isn't it like our Heavenly Father to give me something I didn't think I wanted because He knew how much it would bless me. What simple blessings has God sent your way? Heart2Soul, Mayflower, bbyrd009 and 5 others like this. I loved that story. Thank you for sharing it. Bless you...Yes, she must be precious now...a gift from Father. amadeus, Nancy and Prayer Warrior like this. Isn't it like our Heavenly Father to give me something I didn't think I wanted because He knew how much it would bless me. What simple blessing has God sent your way? Thanks, Nancy! I agree. He must have really enjoyed making all the different varieties! I believe He made them with us in mind, knowing how much we would enjoy them. amadeus and Nancy like this. Man, I’ve really missed you! I hope you can see your way to be on the forum more! Nancy, "ByGrace" and amadeus like this. @Prayer Warrior So does the parakeet sing for you most mornings? Where I grew up in NZ the bird life is very sparse. 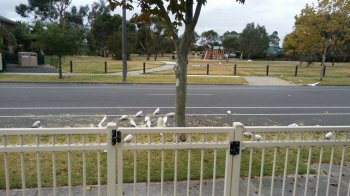 The usual minahs and sparrows, magpies and fantails. In the bush there are some beautiful songbirds, such as the Tui and Bellbird, and a reasonable variety of wading birds in swamps and the beach, but generally, it is a quiet country for bird watchers. One has to ravel and deliberately venture forth to see or hear them. I worked in the bush for many years, and learned how to call tuis, and had pigeons eating muesli bars from my hand. Love birds. Since being in Australia however it is a very different story. Even here in suburbia we are woken by crows, and entertained all day by lorakeets, cockatoos, doves, pigeons, all of which come in different flavours and colours, and numerous others I have yet to identify. Hidden In Him, amadeus and Prayer Warrior like this. Sounds like Australia & NZ are havens for birdwatching! Your bird was a real "God send". It's very plain when he sends something, we don't ask if he did - we know it! In the summers here in the Ouachitas the male scarlet Tanager begins singing way before daylight and continues its beautiful intermittent warble through out the day, moving from one pine to another. It winters in south America and comes to the southern, eastern states and into parts of southeastern Canada. Their striking black wings against the scarlet red body are something Jesus really enjoyed designing. Along with the indigo bunting, summer Tananger, pine warbler and nut hatch they are my favorite I think. Similar to the cardinal bird! Yup, and afternoons.... I can get her to sing if I chirp at her. LOL If we get too noisy, she fusses at us any time of day or night. Thanks for sharing the pics, Frank Lee. The scarlet tanager is such a beautiful bird. I don't think I've ever seen one in person. Where I live, we have a lot of cardinals (my favorite bird--don't tell Birdie), gorgeous bluebirds, gold finches, bluejays, lots of red-winged blackbirds in season, chickadees, sparrows, too many crows, hawks, blue herons, etc. Sometimes we hear an owl at night. Last spring a female cardinal built a nest in a rose bush right off our porch. She laid some eggs, but they disappeared. I guess the nest was raided. Living above a small river we notice annual migrations of the Sulphurs - yellow butterflies by the hundreds. Also hawks migrate down these waterways. Occasionally a bald eagle. Living up in the woods as we do there's always something to see or hear. I've attached a short video I took by game cam of a whippoorwill sitting on her nest of two eggs. I did see them after they hatched but they skedaddled before I could photograph them. Nest was a hundred yards from our house. Critters are a special gift from the Lord. I consider my squirrels to be the little angels the Lord sends by each day to make me happy. Hidden In Him, Prayer Warrior and Dave L like this. LOL, you got that right! Looks like a beautiful place! My avatar is a photo I took of a sunset in my area. I love squirrels. The guy who lives in the house behind mine shoots squirrels.